Call The Aerial Guys today on 01204 292035 for a no obligation estimate and to arrange an appointment. If you live in Bolton and are looking for local TV or satellite installation and repair experts, then call The Aerial Guys. We are passionate about providing you with the best possible service. Contact us today on 01204 292035 to book an appointment. With an extensive network of engineers, working across the North of England, The Aerial Guys will do their best to ensure an expert engineer visits your Bolton home on the same day. We have carried out numerous TV aerial installations in Bolton over the years. So, unlike more impersonal companies, The Aerial Guys really are able to give you and your family a local service that you can trust. Our friendly and professional engineers will assess your TV aerial requirements, always offering a fixed price quote before any work begins. So, whether you need TV aerial repairs in Bolton, or are installing a new TV setup, The Aerial Guys are ready and waiting to give you a clearer picture. Why not speak to one of our technical advisers today on 01204 292035 to find out how to arrange a visit from your local Bolton engineer. The Aerial Guys are also experts in satellite installations and repairs. 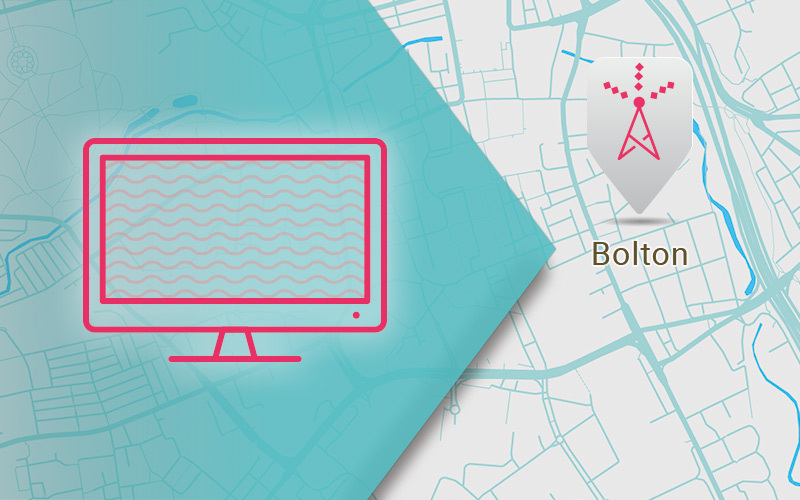 If you require a comprehensive satellite installation in Bolton then our engineers can arrange everything – from fitting your satellite dish, to configuring your set-top box and cabling. Here at The Aerial Guys, we are specialists in all the main satellite services, including Sky, Freesat and European satellite installations. Is your satellite signal driving you mad with a pixelated image or jerky picture? The Aerial Guys can carry out full satellite repairs in Bolton and the surrounding area. Our professional engineers carry a wide range of equipment suitable for all the main satellite types, which means that we can often fix the problem on the same day. So, if you live in the Bolton area, and need a local satellite repair service, speak to The Aerial Guys today on 01204 292035. If you live in the Bolton area and are in need of a local TV aerial installer, make The Aerial Guys your first choice. Established in 1991, The Aerial Guys know Bolton and the surrounding area, like the back of our hands. This guarantees that we can be with you almost immediately, when you need our services the most. Call us today on 01204 292035 to book an appointment in the Bolton region. Rob is a bar manager in Bolton. The satellite system in his pub is crucial to the customers, so when the TV screens started to flicker, Rob knew he had to call in the experts. “We had a big match on the horizon and I knew I’d be in big trouble if the regulars couldn’t get to watch it. I tried one of the bigger companies first but they were too busy to come out. But when I contacted The Aerial Guys – well, it was about as different an experience as you could imagine. “The engineer was so friendly and he was out to fix the system that day. I couldn’t believe how efficient The Aerial Guys were. They fixed our whole system in an afternoon. It was really impressive! My customers are so pleased with me now. I can get ready for the big game and just relax now that I know the TVs are working better than ever,” Rob says.